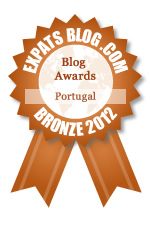 ExpatsBlog.com Expat Blog Awards 2012: Portugal Bronze Award! This blog won the Bronze Award for best expat blog in Portugal! I strongly recommend the Oregon Expat blog. The author is an American living in the Algarve of Portugal. The blog covers a range of topics such as science, technology, politics, culture, and traveling within Portugal. The blog is well-written, informative, humorous, and entertaining. The author's ability to be both inside and outside of two cultures provides some fascinating perspectives on and often amusing stories about cultures, language, foods, activities, and politics. Read the blog! Wonderfully eclectic, this blog is a perpetual source of delight (intellectual, visual, aural, and all). It is not only about Portugal--or Oregon for that matter. You can discover and learn about anywhere (on earth and in the Universe) and anything (really vast, unlimited scope) that catches Oregon-Expat's interest and will certainly entertain the not less eclectic, interesting, and international (universal? ;)) audience. Oregon Expat hooked me since I discovered this blog more than two years ago. Every day I enjoy a colorful local festival, a surprising science discovery, a wonderful wallpaper, a funny add, a gorgeous nature photo, a personal view on a topical issue, an astronomy beauty, a delicious dish, a butterfly, a music moment, a tour of a town, a simple and amazing scientific explanation, a flower, a sharp-witted comment, a winery, a complete recap of a major event, a chameleonâ€¦ pieces of a fascinating mosaic built with honest intellectual curiosity and a fine sense of humor. Iâ€™m not American, nor Portuguese, but Iâ€™m looking forward to the next post by this good photographer and excellent writer. Oregon Expat gathers many of the things that make life fun and interesting and puts them into exquisite, witty writing. There's travel and culture, music and art, technology and science, and every once in a while some cute news story or neat computer trick that would have slipped under my radar. The author is a writer and a scientist, which is readily apparent in the texts. There are also fantastic photos from travels and from every day life in beautiful Algarve. Do not miss! Seems to me I've been reading this blog forever ... and I usually check every day for new posts. Most of my wallpapers come from here and are usually the envy of my colleagues. :-) As for the blog posts I especially appreciate the great mix of topics from humor to culture to economic and scientific to ... Strongly recommend it!!! Oregon Expat is a daily must check for me. It has led me to many, many things I would never have found on my own. I especially like the reading about the explorations of, and commentaries on, Portuguese culture. All together it is a perceptive, well written and honest reflection of the author's micro and macro world view. I've been reading Oregon Expat's blog since it started. I check for updates every day becasue I know I will be surprised by the eclectic material I will find. I've learned so much about Portugal that I plan to visit someday. I also find lots of interesting information on such a variety of topics. My favourites are...well, to be fair, it's hard to pick favourites because the blog never disappoints and always delights. The author writes in an accessible and affable way that is also clearly well-informed and well-researched. Oh, and the visuals are beautiful. I highly recommend this blog. The fact that I am myself a Portuguese expat in Oregon was only the vehicle for me to find this blog. What keeps me coming back every day is a wide range of factors, from the already mentioned eclectic nature of the posts to the unmatched quality of the writing, not to mention the consistent and enticing tone, at once thoughtful, humorous, rational and scientifically minded (OK, wonderfully geeky). Plus, the photos are never not excellent. That alone would be enough, but there's something extra for me: the clear, honest and totally accurate depiction of my country's realities, through the eyes of an American who has not, even if the opposite may be perceived, lived for that long in it. The way I see a foreigner "get" the people, the culture and the environment. And the way it all gets presented, described and analyzed in the most interesting and, not infrequently, funny form. One final and important factor is the quality of the visitors and their comments. I could go on. But you can check for yourself! Read. This. Blog. My days are brightened by the daily dose of expat perspective on a local or world issue Oregon Expat provides! I agree wholeheartedly with all the people who have responded to this blog. I look forward every day to this blog and feel an upsetting emptiness when Expat takes a break, even though it's always for an important reason.